The stretch of Yonge Street between Finch and Sheppard avenues that was the scene of a deadly van attack on Monday afternoon has reopened. Yonge Street has been completely closed between North York Boulevard and Cummer Avenue since the attack, which left 10 people dead and 14 others injured. The roadway and North York Centre subway station reopened at around 7 p.m. on Tuesday but police are continuing to ask people who do not have to come to the area to street clear as an investigation is still underway. Meanwhile, the city says that North York Civic Centre will reopen on Wednesday morning for the first time since Monday’s attack. 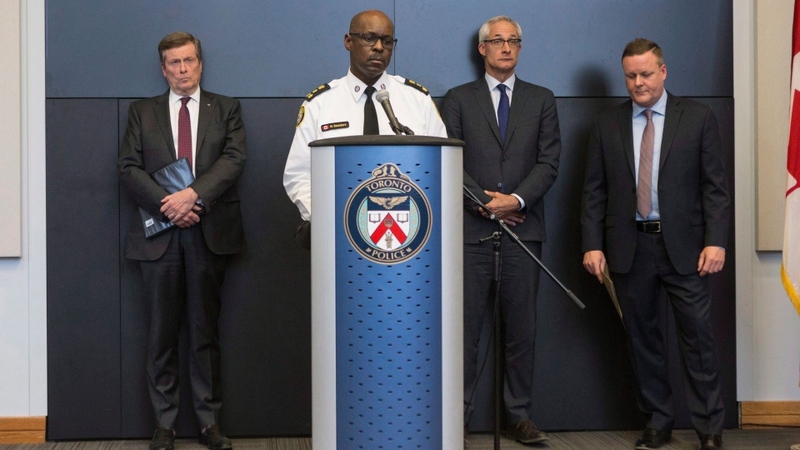 At a news conference on Tuesday afternoon, Police Chief Mark Saunders said that officers from Peel Regional Police and York Regional Police have been assisting Toronto police at the scene in order to “expedite” the investigation. “We are looking at approximately a one kilometer strip of the busiest street in the country and there is a lot of evidence that needs to be gathered, however we have tried to take every measure possible to expedite the processing of the scene without compromising the integrity of the investigation,” Saunders said on Tuesday. Police told reporters at Tuesday’s news conference that the suspect in the attack rented a white van at a Ryder facility north of Toronto on Monday morning. 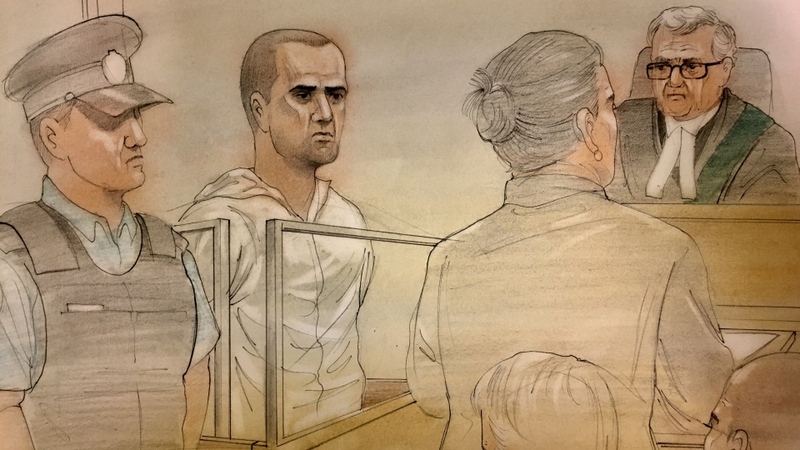 They allege the suspect then made his way to the Yonge Street and Finch Avenue area, where he mounted a sidewalk and began “deliberately” hitting pedestrians. 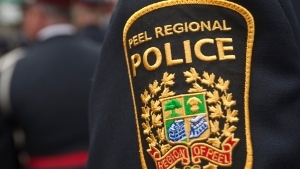 He said that a total of seven minutes elapsed between the first 911 call and the arrest of 25-year-old Alek Minassian near Yonge Street and Sheppard Avenue. Monday’s attack took the lives of 10 people and sent the shockwaves across the city as a whole. “In terms of its sort of moral fiber and spirit people are showing the world our best even on our darkest days,” Tory said. Tory said that in order to “bring a degree of coordination” to the myriad of people and groups who have expressed a desire to help raise money, the city is partnering with the Toronto Foundation on a central campaign dubbed #Torontostrong. “This will ensure that donations can be put together in one place and then flow to families and agencies and others in an orderly fashion,” Tory says. Minassian appeared in court on Tuesday where he was formally charged with 10 counts of first-degree murder and 13 counts of attempted murder, though Gibson said that he is likely to face an additional attempted murder charge. Sources told CTV News Monday that Minassian was not known to police prior to the incident. He has been remanded into custody and will return to court on May 10. A man believed to be the father of the accused attended today’s court appearance but did not speak to reporters when questioned outside the courthouse. A driver who said he was behind the van as the incident was unfolding said he eventually started honking to warn pedestrians when he saw the vehicle strike people walking on the sidewalk. “At the beginning I thought I want to make him stop because I’m literally about 20, 30 metres behind him but he is not stopping and he is driving faster on the sidewalks and I am on the road,” he told CP24. He said he then decided to continue to follow the vehicle and honk to warn people on the street about the danger. Witness videos sent to CP24 show a dramatic takedown of the suspect on the sidewalk on Poyntz Avenue. The videos show a man exiting a badly damaged white rental van as an officer points a firearm at the suspect. A source confirmed to CP24’s crime specialist Steve Ryan that prior to the arrest, the man asked police officers to shoot him. The suspect was seen pointing an item at the officer during the interaction but police later confirmed that the object was not in fact a weapon. The man was eventually brought to the ground and taken into custody. 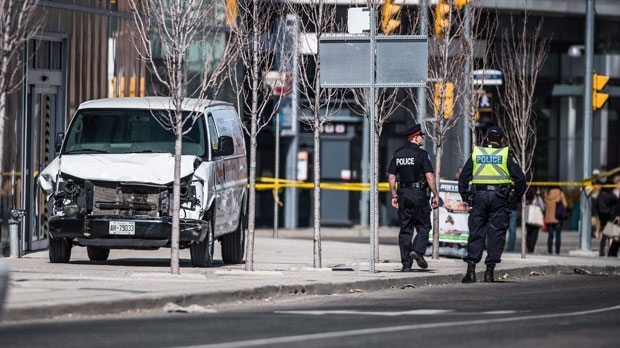 Toronto Police Chief Mark Saunders told reporters Monday night that police are exploring “all lanes” in their investigation and are trying to determine exactly what the van driver’s motivation was in the deadly attack. Three of the 10 victims of the tragedy have been identified. Anne Marie D’Amico, Chul Min “Eddie” Kang and Dorothy Sewell were killed in the attack. Police have not confirmed the identities of any of the victims killed in the incident. A South Korean news agency reported Tuesday that two South Koreans were among those killed on Yonge Street on Monday. Another South Korean was among the injured, the news agency said, citing the South Korean government as its source. Seneca College confirmed that one of its students died following the incident but did not release the name of the victim. "The Seneca community is deeply saddened by the horrific attack on Yonge Street yesterday. Our thoughts are with all those affected, including the family and friends of one of our students who died as a result of the tragic incident," Seneca College spokesperson Lisa Pires said in an emailed statement. "Along with the rest of the city, and world, we are extremely troubled by yesterday’s events. For privacy reasons we do not disclose information about our students and employees. Out of respect for those involved, we will not be providing further comment. We ask the media to respect our community during this difficult time." 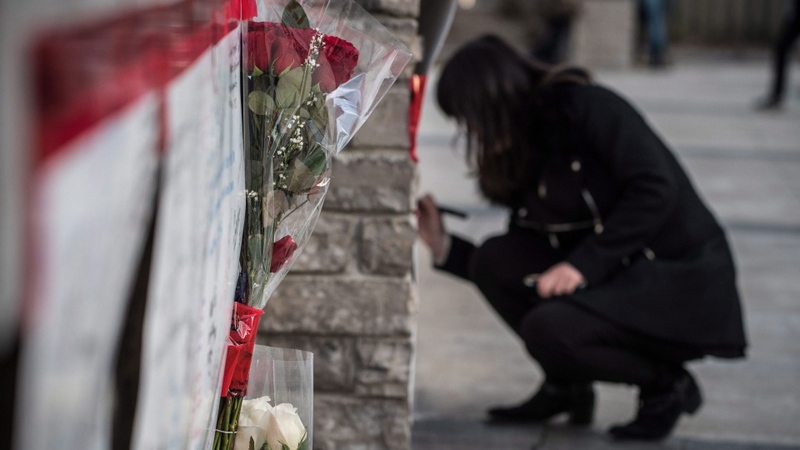 Flowers and messages of condolence could be seen at a growing memorial that has been set up in Olive Square, near Yonge Street and Finch Avenue, in honour of those impacted by the tragedy. Mayor John Tory and Premier Kathleen Wynne attended the memorial this afternoon. Wynne said the province is prepared to provide the city with whatever support is needed. "We’ve offered extra victim services supports to the City of Toronto," Wynne told reporters. Tuesday's Toronto city council meeting was postponed until Wednesday but Tory asked councillors to meet at city hall today to express their condolences. “Our hearts are with all of those affected,” he said. The mayor went on to thank hospital staff as well as first responders and citizens at the scene who exhibited “great bravery” during the ordeal. “We know that we are strong and resilient and will not be thrown off course by one person or one act,” Tory said. Coun. John Filion, whose ward encompasses the area where the attack took place, recognized the “tremendous emotional toll” the incident has taken on those in the area who rushed in to help in any way they could. “Hopefully this will have all of us be a little kinder to each other on regular days,” he told his fellow councillors at city hall Tuesday. Speaking at Parliament Hill on Tuesday morning, Prime Minister Justin Trudeau called the incident "horrific" and "senseless." "On behalf of all Canadians, I offer my deepest, heartfelt condolences to the loved ones of all those who were killed and we wish a full recovery to those injured and stand with the families and friends of the victims," Trudeau said. The prime minister added that there is nothing to suggest that there is a national security element to the situation. 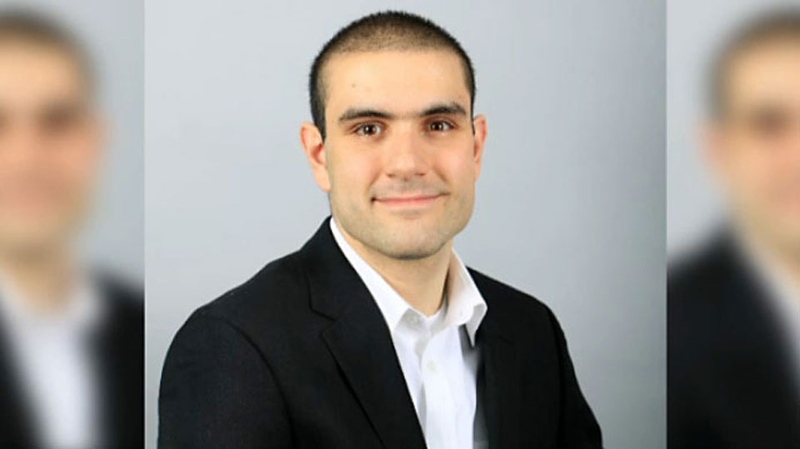 25-year-old Richmond Hill resident Alek Minassian appears in this Linkedin photo.